Spacecraft operating in the inner Solar System usually rely on the use of photovoltaic solar panels to derive electricity from sunlight. In the outer solar system, where the sunlight is too weak to produce sufficient power, radioisotope thermoelectric generators (RTGs) are used as a power source. The first spacecraft to use solar panels was the Vanguard 1 satellite, launched by the US in 1958. This was largely because of the influence of Dr. Hans Ziegler, who can be regarded as the father of spacecraft solar power. The solar panels on the SMM satellite provided electrical power. Here it is being captured by an astronaut in a mobile space-suit that runs on chemical battery power. power to run the sensors, active heating, cooling and telemetry. power for spacecraft propulsion – electric propulsion, sometimes called solar-electric propulsion. For both uses, a key figure of merit of the solar panels is the specific power (watts generated divided by solar array mass), which indicates on a relative basis how much power one array will generate for a given launch mass relative to another. Another key metric is stowed packing efficiency (deployed watts produced divided by stowed volume), which indicates how easily the array will fit into a launch vehicle. Yet another key metric is cost (dollars per watt). To increase the specific power, typical solar panels on spacecraft use close-packed solar cell rectangles that cover nearly 100% of the sun-visible area of the solar panels, rather than the solar wafer circles which, even though close-packed, cover about 90% of the sun-visible area of typical solar panels on earth. However, some solar panels on spacecraft have solar cells that cover only 30% of the sun-visible area. Diagram of the Spacecraft Bus on the planned James Webb Space Telescope, which is powered by solar panels (coloured green in this 3/4 view). Note that shorter light purple extensions are radiator shades not solar panels. Solar panels need to have a lot of surface area that can be pointed towards the Sun as the spacecraft moves. More exposed surface area means more electricity can be converted from light energy from the Sun. Since spacecraft have to be small, this limits the amount of power that can be produced. All electrical circuits generate waste heat; in addition, solar arrays act as optical and thermal as well as electrical collectors. Heat must be radiated from their surfaces. High-power spacecraft may have solar arrays that compete with the active payload itself for thermal dissipation. The innermost panel of arrays may be "blank" to reduce the overlap of views to space. Such spacecraft include the higher-power communications satellites (e.g., later-generation TDRS) and Venus Express, not high-powered but closer to the Sun. Spacecraft are built so that the solar panels can be pivoted as the spacecraft moves. Thus, they can always stay in the direct path of the light rays no matter how the spacecraft is pointed. Spacecraft are usually designed with solar panels that can always be pointed at the Sun, even as the rest of the body of the spacecraft moves around, much as a tank turret can be aimed independently of where the tank is going. A tracking mechanism is often incorporated into the solar arrays to keep the array pointed towards the sun. Sometimes, satellite operators purposefully orient the solar panels to "off point," or out of direct alignment from the Sun. This happens if the batteries are completely charged and the amount of electricity needed is lower than the amount of electricity made; off-pointing is also sometimes used on the International Space Station for orbital drag reduction. Juno is the second spacecraft to orbit Jupiter and the first solar-powered craft to do so. Space contains varying levels of ionizing radiation, that which includes flares and other solar events. Some satellites orbit within the protective zone of the magnetosphere, while others do not. Gallium arsenide-based solar cells are typically favored over crystalline silicon in industry because they have a higher efficiency and degrade more slowly than silicon in the radiation present in space. The most efficient solar cells currently in production are multi-junction photovoltaic cells. These use a combination of several layers of gallium arsenide, indium gallium phosphide, and germanium to capture more energy from the solar spectrum. Leading edge multi-junction cells are capable of exceeding 38.8% under non-concentrated AM1.5G illumination and 46% using concentrated AM1.5G illumination. To date, solar power, other than for propulsion, has been practical for spacecraft operating no farther from the Sun than the orbit of Jupiter. For example, Juno, Magellan, Mars Global Surveyor, and Mars Observer used solar power as does the Earth-orbiting, Hubble Space Telescope. 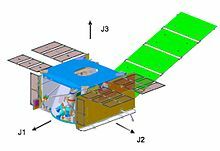 The Rosetta space probe, launched 2 March 2004, used its 64 square metres (690 sq ft) of solar panels as far as the orbit of Jupiter (5.25 AU); previously the furthest use was the Stardust spacecraft at 2 AU. Solar power for propulsion was also used on the European lunar mission SMART-1 with a Hall effect thruster. The Juno mission, launched in 2011, is the first mission to Jupiter (arrived at Jupiter on July 4, 2016) to use solar panels instead of the traditional RTGs that are used by previous outer solar system missions, making it the furthest spacecraft to use solar panels to date. It has 72 square metres (780 sq ft) of panels. Another spacecraft of interest is Dawn which went into orbit around 4 Vesta in 2011. It used ion thrusters to get to Ceres. The potential for solar powered spacecraft beyond Jupiter has been studied. The International Space Station also uses solar arrays to power everything on the station. The 262,400 solar cells cover around 27,000 square feet (2,500 m2) of space. There are four sets of solar arrays that power the station and the fourth set of arrays were installed in March 2009. 84 to 120 kilowatts of electricity can be generated from these solar arrays. Flexible solar arrays are being investigated for use in space. The Roll Out Solar Array (ROSA) was deployed on the International Space Station in July 2017. For future missions, it is desirable to reduce solar array mass, and to increase the power generated per unit area. This will reduce overall spacecraft mass, and may make the operation of solar-powered spacecraft feasible at larger distances from the sun. Solar array mass could be reduced with thin-film photovoltaic cells, flexible blanket substrates, and composite support structures. Solar array efficiency could be improved by using new photovoltaic cell materials and solar concentrators that intensify the incident sunlight. Photovoltaic concentrator solar arrays for primary spacecraft power are devices which intensify the sunlight on the photovoltaics. This design uses a flat lens, called a Fresnel lens, which takes a large area of sunlight and concentrates it onto a smaller spot. The same principle is used to start fires with a magnifying glass on a sunny day. Solar concentrators put one of these lenses over every solar cell. This focuses light from the large concentrator area down to the smaller cell area. This allows the quantity of expensive solar cells to be reduced by the amount of concentration. Concentrators work best when there is a single source of light and the concentrator can be pointed right at it. This is ideal in space, where the Sun is a single light source. 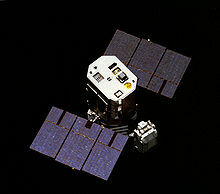 Solar cells are the most expensive part of solar arrays, and arrays are often a very expensive part of the spacecraft. This technology may allow costs to be cut significantly due to the utilization of less material. ^ Perlin, John (2005). "Late 1950s – Saved by the Space Race". SOLAR EVOLUTION – The History of Solar Energy. The Rahus Institute. Retrieved 2007-02-25. ^ Hoffman, David (July 2000). "Thin Film Solar Array Parametric Assessment". AIAA. AIAA-2000-2919. ^ "Rosetta's frequently asked questions". ESA. Retrieved 2 December 2016. ^ Juno mission page at NASA's New Frontiers Web Site Archived 2007-02-03 at the Wayback Machine. Retrieved 2007-08-31. ^ Jet Propulsion Laboratory: NASA's Juno Spacecraft Breaks Solar Power Distance Record. January 13, 2016. Retrieved July 12, 2016. ^ Mitrica, Dragos (18 January 2016). "NASA's solar-powered Juno shuttle breaks record distance at 793 million km from the Sun". ZME Science. Retrieved 2 December 2016. ^ Garcia, Mark (2017-07-31). "About the Space Station Solar Arrays". NASA. Retrieved 2017-12-06. ^ NASA. "Concentrators Enhance Solar Power Systems". Retrieved 14 June 2014.